Alarmingly, 2019 is the last year of recording for BSBI’s Atlas 2020 project! The pale pink (or is that apricot?) tetrads had pre-2000 records, but are still awaiting updates to post-2000. Can you tackle any of these? You can also see lowland areas still with no records, especially in the west and southwest, where recorders are thin on the ground. Surely the plant will be there? 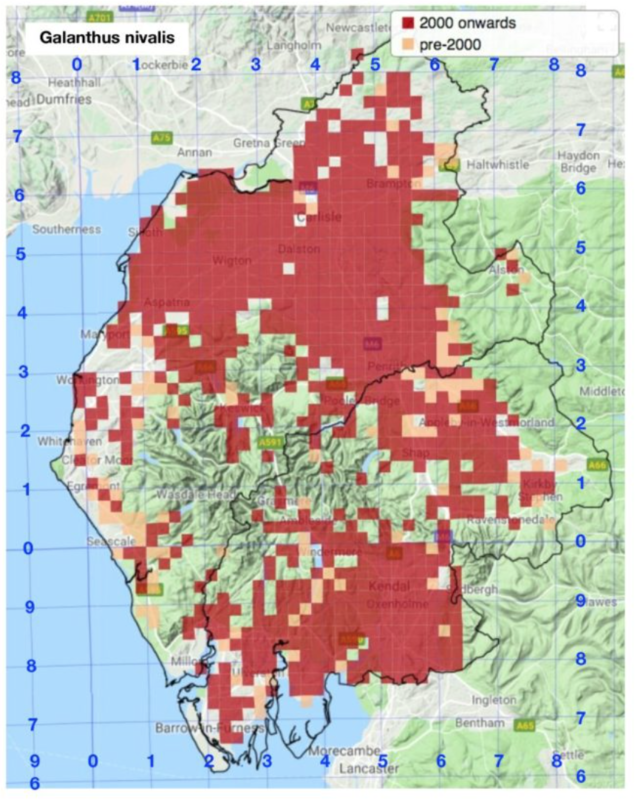 As the physical background map shows, upland areas lack Snowdrops, but the plant may be around farms and hamlets in central Lakeland and the Pennine fringe, perhaps missed previously as most recording has been conducted later in the season when the plant has died back. Records for i) any tetrads with only pre-2000 records, and ii) from previously ‘blank’ tetrads, will be welcomed! 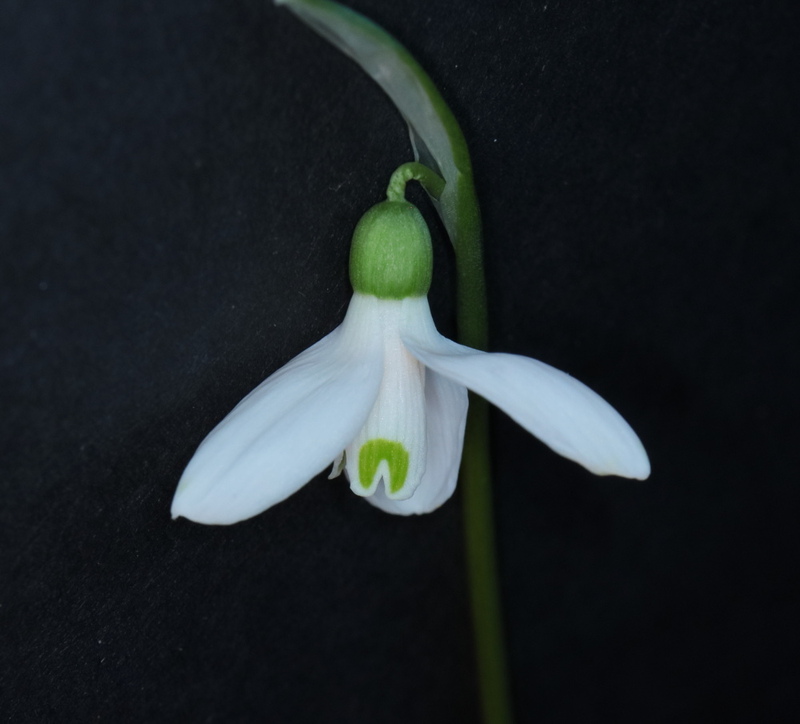 For Galanthus nivalis, being such a common plant, records just to monad accuracy (i.e. 4-figure grid-references) would suffice, but of course 6-figure records will be welcomed for their 10× greater precision. If tetrads already have a monad (or better) record, then extra records are hardly necessary, at this late stage – but especially if you can spend the time instead on seeking updates/new records in other tetrads! It’s all in the pursuance of ‘dots on maps’! 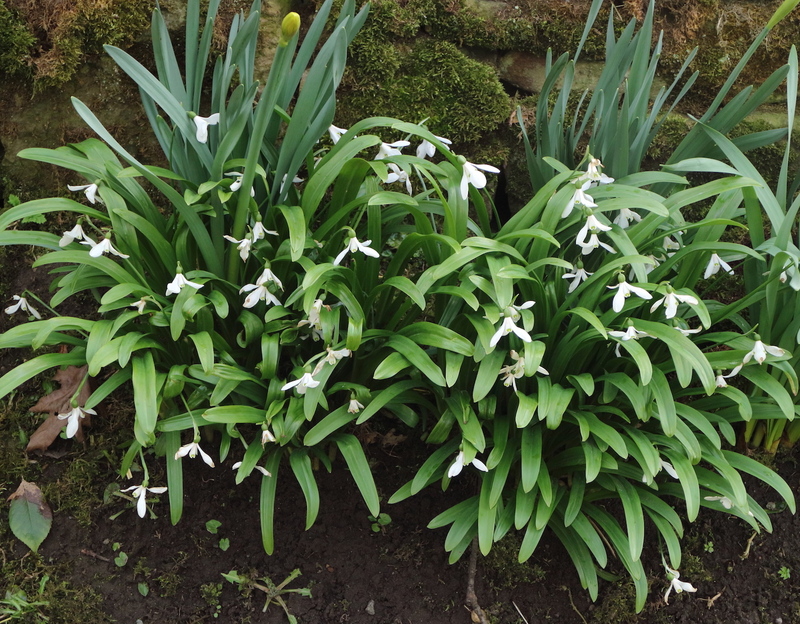 Species other than G. nivalis are very much the exception (see below), so do give 6-figure or preferably 8-figure GRs for those, and more details such as population size, and whether obviously planted, apparently naturalising, etc. Capturing them with photos is also recommended. 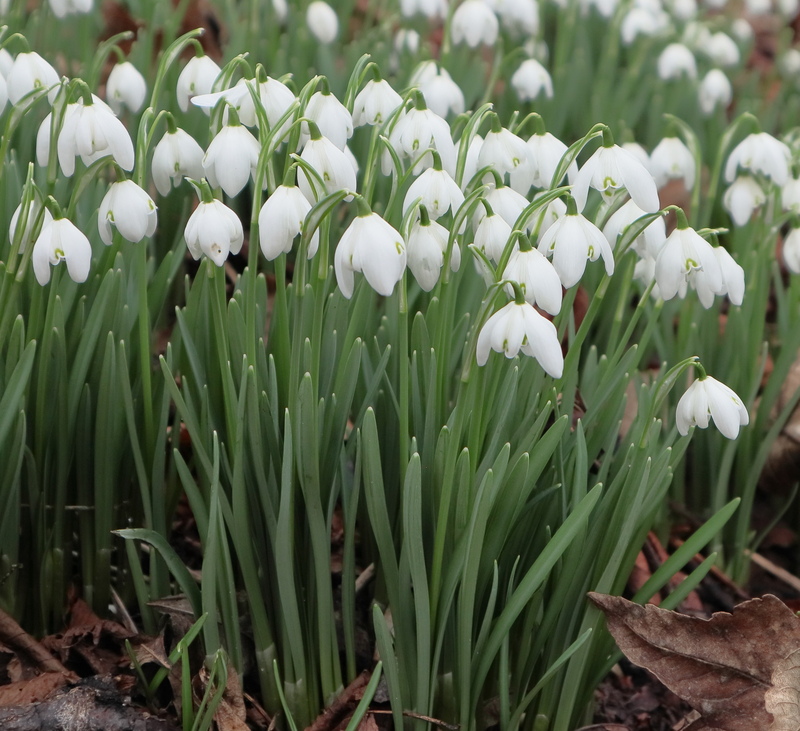 In Cumbria, the vast majority of snowdrops, both cultivated and established anywhere beyond gardens, are the familiar Galanthus nivalis. 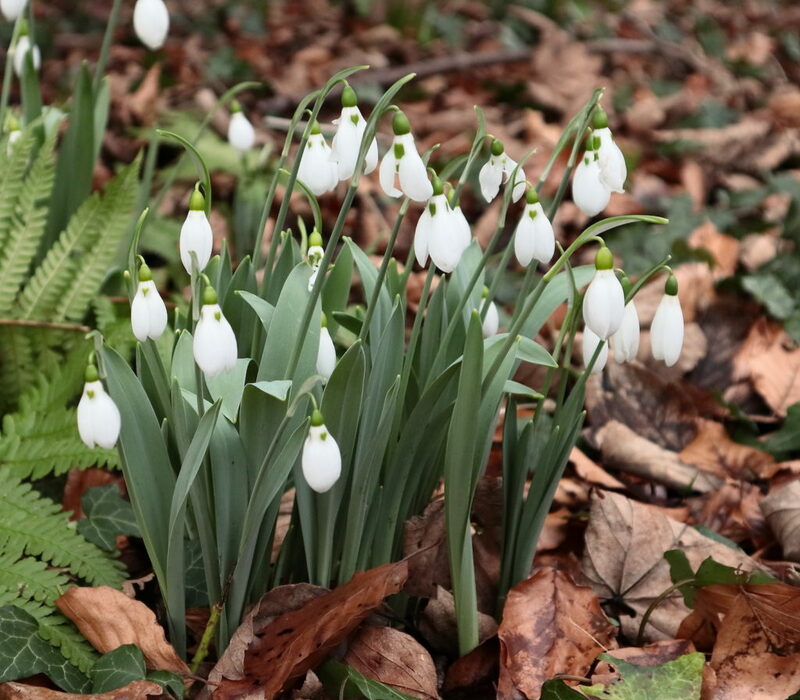 It is nowhere native, but is well-naturalised, and is probably still spreading, although most colonies are close to gardens on lane- and road-sides, sometimes advancing into woodland and parkland, or where dumped on waste ground. 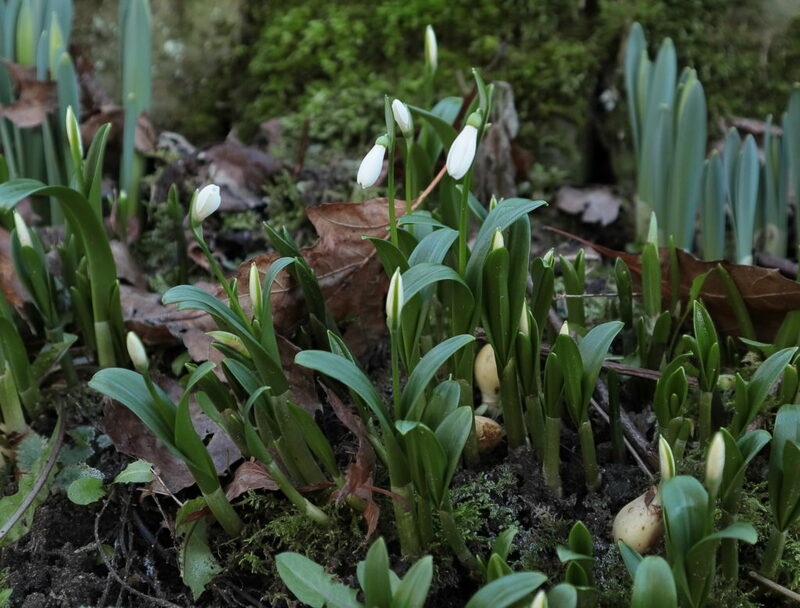 By contrast, bulbs have been very widely dispersed downstream along water-courses to colonise more ‘natural’ habitats of stream- and river-banks. Are there other species naturalised and worth seeking? Do have a look at Mick Crawley’s excellent illustrated guide. At the risk of oversimplification, the species G. nivalis can be identified by its grey/glaucous leaves, which are flat, parallel-sided, and narrow (usually 1 cm or less). 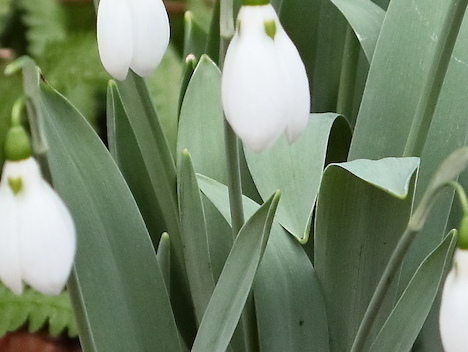 Note that the grey colour in snowdrop leaves is merely a waxy ‘bloom’ which can be readily scuffed off. There are a great many horticultural varieties of the species itself, and others derived from hybrids of it, making a complex picture. 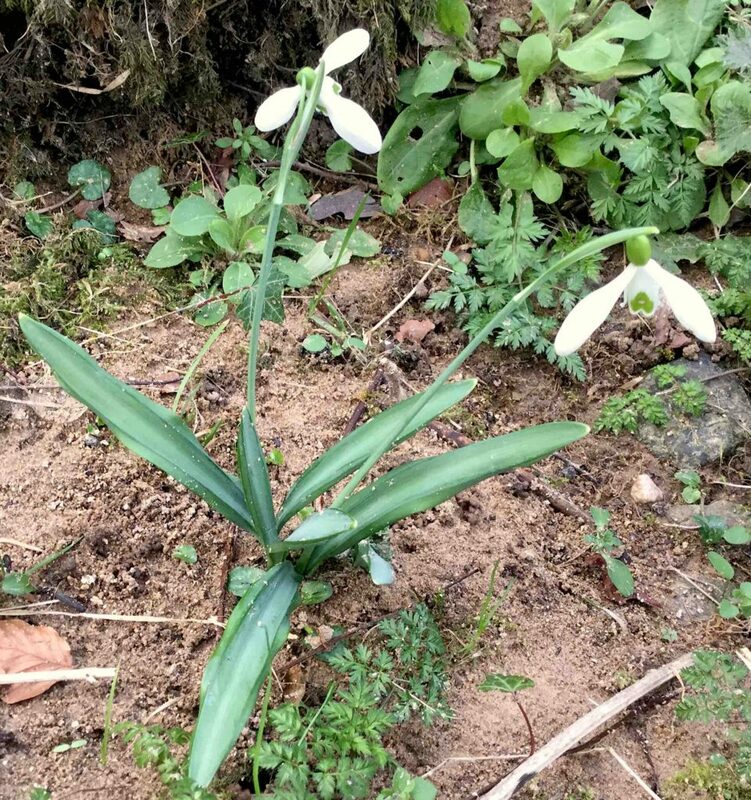 By far the most conspicuous are the ‘double’ forms (Galanthus nivalis ‘Flore Pleno’, or forma pleniflorus), which are nowadays very widespread, separate or often in mixed colonies with ‘single’ plants. The flowers ‘bulge’ obviously, and look ‘like Victorian lampshades’, and can be spotted at some distance with experience. Just turn a flower up to check, if uncertain. 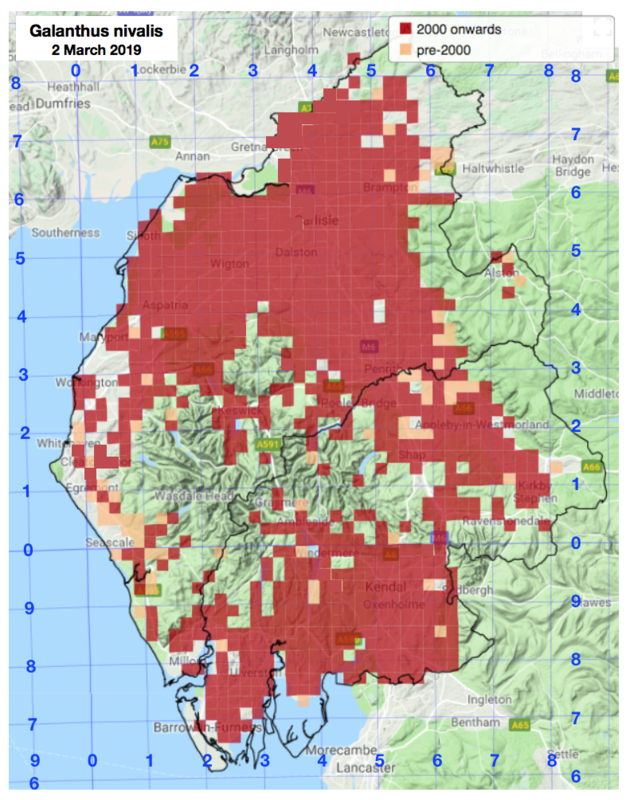 There seem to be only two other species occurring with any frequency ‘out of gardens’ in the county – but both are still very local, although perhaps under-recorded. Do look out for them, and record them. This has a scattered distribution, perhaps via dumped garden waste, and sometimes occurs in estates or parks where not obviously planted. It is a larger plant in all its parts, and has far broader leaves when mature – to 2 cm wide at least, glaucous, and hooded at the tip. An important distinction is that the outer of the pair of leaves is wrapped around the inner leaf (and flower-stalk if any) at the base. (In G. nivalis, and in G. plicatus, below, the two leaves are ‘applanate’: they face each other ‘flat-on’ at their bases, ‘like praying hands’.) The most frequently seen green mark on the inner petals in G. elwesii is a ‘blurry-X-shape’, visible on one of the mature flowers in the second photo below. 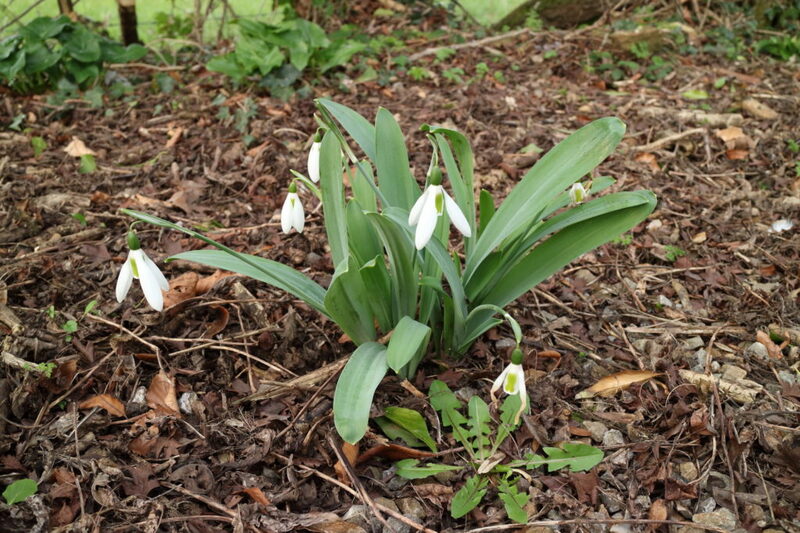 I am not aware of this species native to eastern Europe and the Black Sea being established anywhere in ‘wilder’ places in the county, being a roadside plant in particular, and usually close to the gardens which have been the source. It has glaucous leaves like G. nivalis, applanate – facing each other at the base – in the same way as G. nivalis, but broader (up to 2 cm wide), and distinctively ‘pleated’. The ‘folds’ are also rather greener. 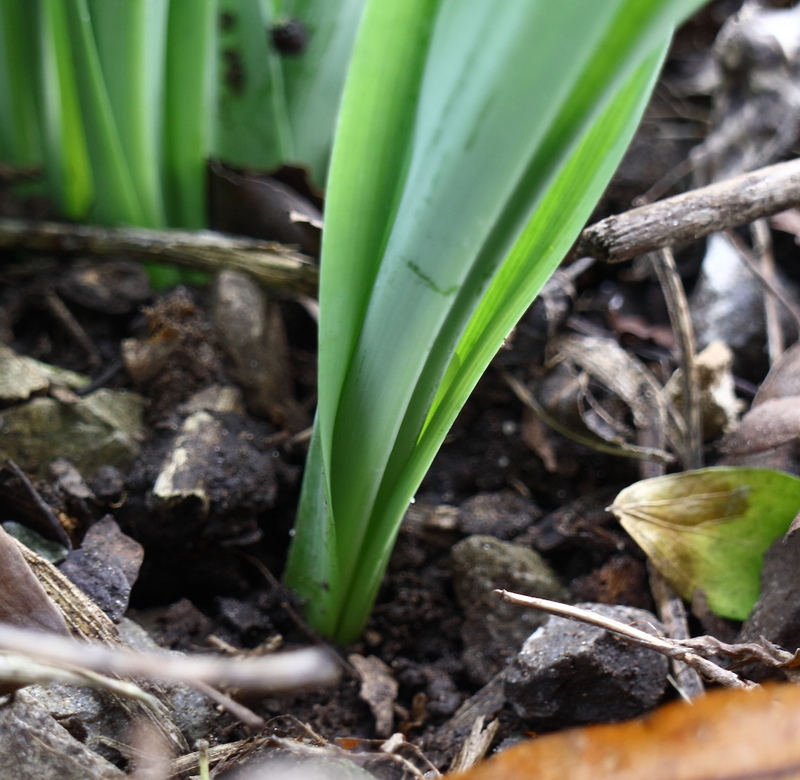 In newly-emerging leaves, the outer margins of the pleats are actually folding right under the leaf – see the diagram on page ‘JU’ of ‘Poland’ (The Vegetative Key…). Other species might possibly be present ‘out there’, so keep an eye out for plants which don’t fall easily into ‘any of the above’. As the significant green markings on the flowers tend to fade rapidly in pressed specimens, identification might be easier from good photos of the whole plant, of the flowers (including closeups of the green markings), and of the leaves from all angles, showing any folding or pleating of the leaves, leaf-tips, and the important arrangement at the very base, applanate or not. Take measurements of maximum leaf-widths. Snowdrops with wide, shiny, bright green leaves ‘from the off’ are likely to be this species. 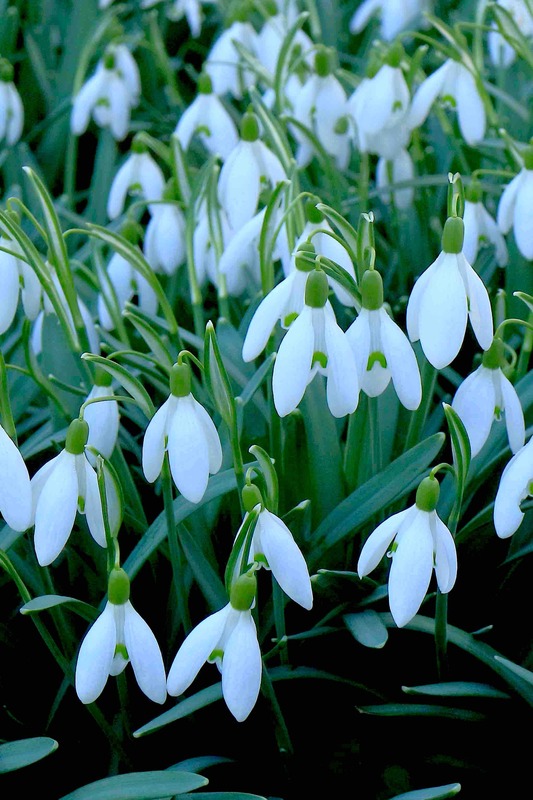 It may be found outside gardens, but may not be truly naturalised anywhere. Like G. elwesii it has a ‘wrapping’ leaf-base. I currently have a specimen collected and named by Professor Donald Pigott, from Greenbank near Cartmel, March 2017. Specimen via Lynne Farrell. The plant is tall, with very long, slender (8 mm), glaucous, twisted leaves. 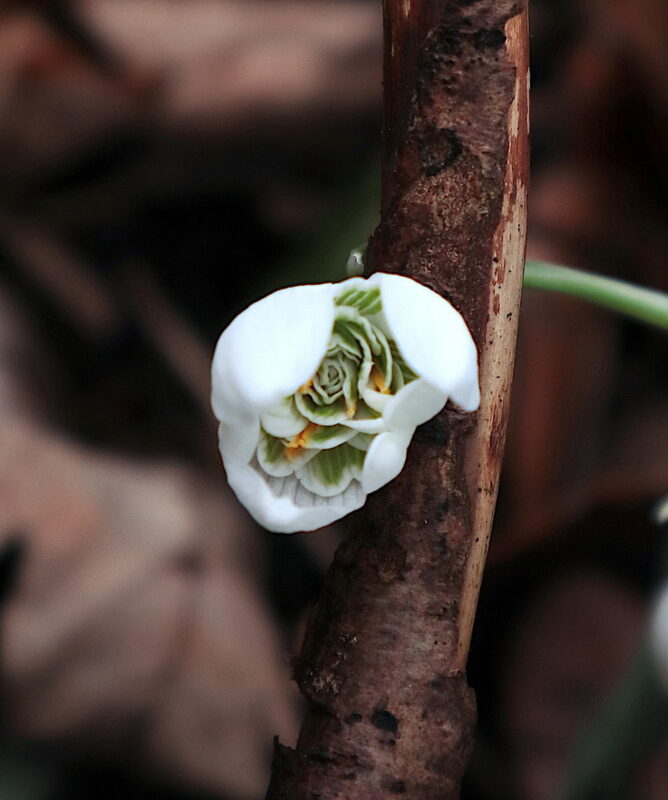 The outer segments of the flower are long and narrow. The inner segments (though faded) appear to have green spots at the tips and a larger patch towards the base. The species is said to be close taxonomically to some variants of G. elwesii despite the different arrangement of the leaves: applanate, as in G. nivalis and G. plicatus, but unlike G. elwesii (IUCN Redlist). In this specimen the leaves are considerably narrower. The species hails from the eastern Balkans and western Turkey. I’d add a photo, but it’s not very informative.